If you had your doubts about this being the year of the Muslim Girl, listen to this: Rashida Tlaib is about to become the first Muslim woman ever (ever) elected to Congress. Let that sink in. A brown, Palestinian, Muslim daughter-of-immigrants is going to fill up a seat in one of the whitest, malest, most conservative Houses in modern history. Since she emerged victorious from a pool of Democratic candidates to win yesterday’s primary, this Queen from Michigan’s 13thDistrict won’t even face a Republican candidate in November’s general election. Here’s how it works, basically. The primaries are an initial race to see who can win their party’s nomination for a political seat (like that initial race between Hillary Clinton and Bernie Sanders, both Democrats). Usually, once you win the primary, you level up to race against members of the opposite party for the seat, nominated and backed by your own party (like Hillary vs. Trump). But here’s the catcher: no Republicans or third-party candidates ran in Michigan’s 13thDistrict on Tuesday. Which means, Rashida Tlaib is going to run unopposed for Congress in November. It’s as close to a sure thing as you can get in politics. Rashida Tlaib, backed by the Democratic Party, is going to take the seat in November. But let’s be real. Rashida isn’t just another run-of-the-mill Democrat; think less Hillary and more the younger, browner, fresher version of Bernie Sanders. She is part of the rising grassroots progressive platform, a group of young leftist Democratic socialists like Alexandria Ocasio-Cortez and Abdul El Sayed, taking politics by storm. And god, is it refreshing. This isn’t the first time she’s made history. In 2008, as Obama set foot in the White House as the first Black President, Rashida became the first Muslim woman to ever serve in Michigan’s state legislature. On her website, under a headline that reads “Why I’m Running,” Rashida states that “I think it’s time for a Congresswoman who’ll fight for us in the streets, in the courts, and in Congress.” And she really couldn’t be more right, or true to her word. Two years ago, Rashida was arrested for yelling “our kids deserve better” at a Trump speech in downtown Detroit. Now she’s going to be a congresswoman. Make no mistake about it: Black citizens showed up for Rashida Tlaib (her district is 57% African-American); Muslims, immigrants, the LGBTQ community showed up for Rashida Tlaib. This is representative democracy. This is what all the hype is about. If you ask me, this Muslim political uprising has been long overdue. The history books will remember Michigan as the political arena and Rashida Tlaib as the warrior that emerged victorious. But this isn’t where it ends, not even close. 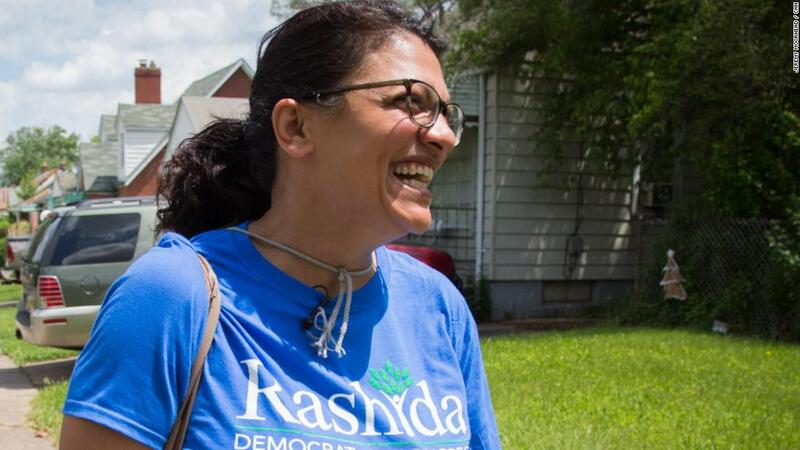 In November, Rashida is set to be elected to Congress officially, but she won’t be the only one. We have to show out to the voting booths, like we did for Rashida Tlaib, to make sure voices that actually speak for us take up those seats in Congress. So, again, vote vote vote. And then in November, we can sit in front of our TVs, popcorn in hand, and watch the fruits of our labor take seats away from the white men. Salma is a Political Science and Human Rights student at the University of Chicago.